Yowza has been cutting models left and right this season. This model has been discontinued. This was a sturdy machine that can stand the constant abuse of a serious runner. The company that builds Yowza products, GreenMaster, is known for their high quality products and low maintenance machines. The Daytona Plus came with an Intelligent Weight Management scale that links with the MyLiveLight app so that you can track your weight and progress towards your fitness goals. It was also Bluetooth compatible with quality speakers and comes with a 63” overall length to accommodate tall runners with long strides. NOTE: We recommend you check out a different more reliable brand like the Sole Fitness F85 instead. Swing-Arm Suspension – As with all non-folding Yowza treadmills, the Daytona plus has a unique shock absorption system based on a swing arm at the front of a machine. Much like the shocks on your car, this arm allows the deck to give with each step to cushion the impact of your running stride. As your foot travels back on the tread belt, you will experience a firm surface from which to push off. We would describe this running surface as a bit ‘stiffer’ than some of the options out there, but it is still comfortable to run on. It is up to your personal preference. The Yowza Boca treadmill has a more forgiving surface if you’d like to check out a similar model from Yowza. Motion Control – This is one of our favorite features on the Yowza treadmills. Two sensors are located on the handrails that allow you to moderate your speed with the simple wave of your hand. Instead of punching in numbers mid-workout, this system lets you wave your right hand to speed up, wave your left hand to slow down, and wave both hands to stop the machine. 3.5 Continuous Duty HP Motor – This is an industrial strength motor that runs at a quiet volume. The Yowza manufacturers are so confident in their motor that it comes with a lifetime warranty. 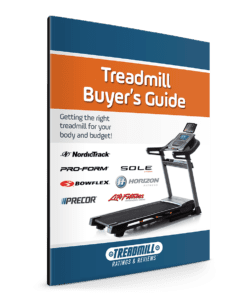 Intelligent Weight Management and MyLiveLight – One of the main differences between the Daytona Plus and Daytona treadmills is this feature right here. Both treadmills come with scales equipped with IWM, but the Daytona Plus has a scale that communicates via Bluetooth to an online app called MyLiveLight. This app allows you to track your workouts, goals, weight, and nutrition. After weighing yourself, this system will actually recommend a workout for you to help you meet your goals. You can choose to perform this workout and watch the virtual avatar running on the MyLiveLight app on your smart device. If you prefer, you can do your own workout and still record your session. It has been proven that those who track their progress do better at reaching their goals. IWM and MyLiveLight will help you have a better chance of seeing real changes in your fitness. FitSound Music Streaming – The Daytona Plus is Bluetooth enabled so that you can effortlessly connect your smart device. This allows you to play your own music through their speakers for a more exciting running experience. Best of all, if a telephone call comes during your workout, you can press a key on your console and talk to your friend through the treadmill’s speakers. Although these aren’t home-entertainment-center quality speakers, we were satisfied with the sound that they produced. 20” x 63” Tread Belt – The Daytona Plus has the longest belt that Yowza Fitness offers. It will comfortably accommodate taller individuals with long running strides. 249 lb Unit Weight – This machine is heavy enough to provide a sturdy feel during your workout. 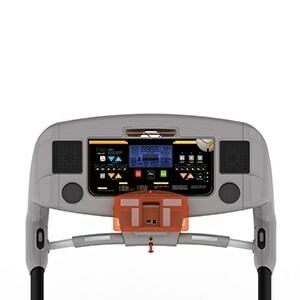 Mediaport – The Daytona Plus treadmill includes a media port to hook up your smart device. A MP3 and USB connection are included so that you can be entertained during your workout. We especially liked that this mediaport does not interfere with or block the regular running display. Workout Programs – The Daytona Plus comes with fifteen installed programs and the ability to track seven different users. These programs include a 5K LEARN program and a Heart Rate Control Program that adjusts intensity based on real-time readings of your heart rate. 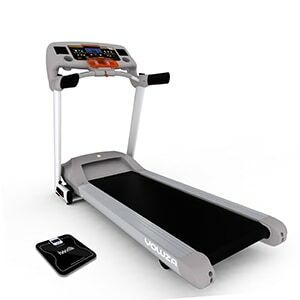 Heart Rate Control – A wireless heart rate monitor belt is included with this treadmill. This type of heart rate monitoring is more convenient than the hand-held grips and provides more accurate readings. It’s a nice addition. Console Design and Features – This console builds on the stylish design of the Daytona model. It is a sleek design with a three-speed fan, easy-to-read display, 12 mph maximum speed, quick press speed and incline buttons, and two water bottle holders. Our only note was that the water bottle holders will only accommodate narrow bottles. Warranty – The quality of a company’s warranty is always a good indicator of the faith they have in their own products. With the Daytona Plus, you will see a very strong warranty for Lifetime motor and frame, 5-years on parts and electronics, and 2-years on in-home labor. The Daytona Plus treadmill was great machine from Yowza Fitness. It combines many of the innovative technologies like Swing Arm Suspension, MyLiveLight, and Motion Control with the classic quality that you would expect from its manufacturer. Since this company seems to be having some issues, we recommend you check out a model like the Sole Fitness F85 instead.